This piece originally appeared in Issue 1/2016 of New Eastern Europe. Subscribe now. A century ago, Babyn Yar (also often referred to as “Babi Yar”) was a vast ravine on the edge of the city of Kyiv. Today, this place is actually located in the centre of the Ukrainian capital and is now built up with roads, an underground, parks and apartment blocks. 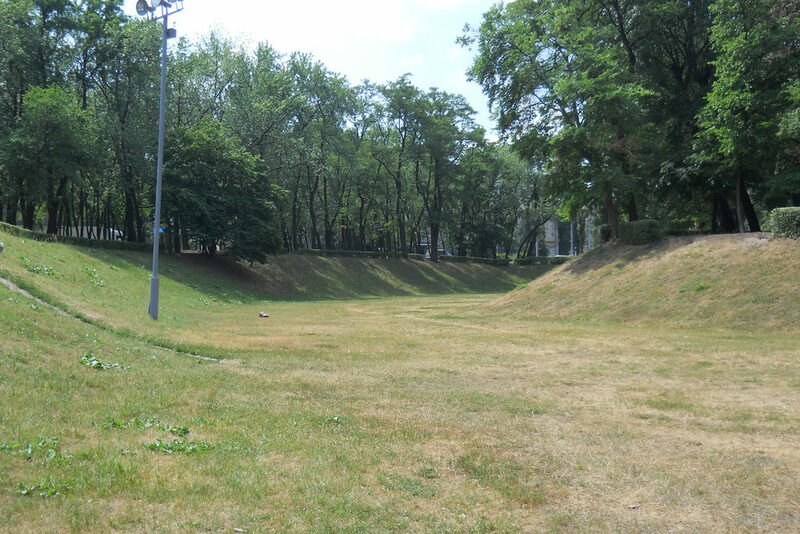 Initially the Babyn Yar hillslopes were rather steep and in some places its depth ranged from 10 to 50 metres. In the 19th and the first half of the 20th century there were several cemeteries here: Orthodox, Jewish, Karaim and Muslim. At that time, in a nearby settlement called Syrets, there were barracks with firing ranges which belonged to the Russian imperial army. After the Soviet regime came to power, a summer camp for the Red Army soldiers soon appeared. Before the Second World War, Babyn Yar was not used as a burial site for the victims of the Holodomor famine or political repressions of the Soviet totalitarian regime, as some people in Ukraine and the Ukrainian diaspora tend to think. 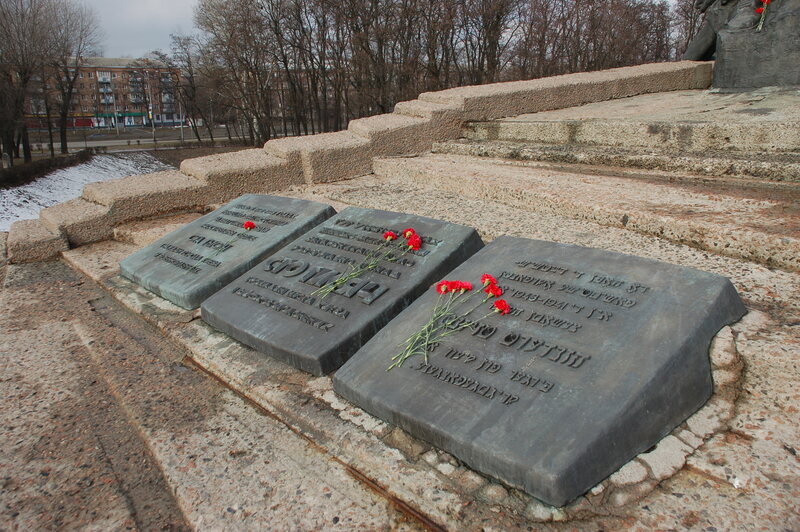 Bodies of the victims of the Stalinist regime were buried in secret mass graves at nearby cemeteries. Some of the Jews who lived in Kyiv before the outbreak of the Soviet-German war left the capital of Soviet Ukraine for the east. Those who remained were for the most part elderly, ill or had such relatives. On September 19th 1941 the Wehrmacht occupied Kyiv and the next day there was a large explosion at the armoury near the Kyiv Pechersk Lavra, a historic monastery. This explosion was used as a pretext for arresting the Jewish population of the city by the German military. On September 24th, pursuant to the order of the occupation administration, the local population gathered at a building on the main street of Khreshchatyk, where the toy store used to be. The order was for the local population to turn in their hunting weapons, gas masks and radios. Suddenly around 2pm, there was an explosion. Mines, which were left behind by retreating engineers of the Red Army, began to explode, causing a huge fire in the centre of the city. The occupants and collaborationists found a “scapegoat” in the Jews that remained in Kyiv. German SS units began making mass arrests in the city. Jews, communists, and Soviet NKVD agents were among those who were detained. Arrests were followed by executions. The slaughters were carried out in many places, possibly also near the ditches dug by the Soviet prisoners of war in Babyn Yar. On Friday September 26th a landmark joint meeting of the military administration and the SS representatives was held where the decision was adopted that all Jews living in the city should be executed at Babyn Yar, instead of setting up a ghetto in Kyiv. This place was “convenient” as the SS-men had been using the place for mass killing of public officials for several days there. On September 28th the newly created Ukrainian Auxiliary Police circulated an announcement addressed to the Jews of the city Kyiv and its vicinity. According to the order the Jews had to assemble at a given intersection by 8am the next day, bringing along their “documents, money, valuables, warm clothing and linen”. It could be understood from the text that it was not written by a Kyiv resident, as the indicated intersection of “Melnikov and Dokterivska Streets (near the cemetery)” did not exist. The street that was crossing with Melnikov Street was called Dehtiarivska. It was notified that the Jews who would not comply with the order would be shot. The following day, on September 29th, a large group of Jews made up of men, women, children and the elderly, together with their non-Jewish spouses, headed to the aforementioned intersection and then turned to the west, walking on Melnikov Street. There they all went through the gates to the Jewish cemetery which was being patrolled by the Ukrainian Auxiliary Police. According to the witnesses who managed to escape, the entrance to the cemetery was a “point of no return”; only truck drivers could exit from there. From the German side, Sonderkommando 4a and Feldgendarmerie soldiers were present at the site. After walking through the gate, the massive group of people turned left and headed along Kahatna Street (today Sim’i Khokhlovykh Street). There, the Germans forced their victims to give up their documents, which were immediately burnt. The Jews then turned right, entering Laherna Street (today Dorohozhytska Street). The victims were forced to undress and leave their belongings. The men and women were then separated and marched to the ravine for execution. Sometimes the SS-men beat the Jews before shooting them. In the evening after the execution, the Germans, together with their local assistants, scoured the area where the corpses lay and searched for any signs of life. The bodies were then covered with a thin layer of sand. The execution took place between the hours of 10am to 6pm. Those Jews who had not been killed during that time were herded in a local shed and had to wait until the next morning. The shootings then continued. According to a German report, 33,771 Jews were executed in two days – September 29 – 30th, 1941. Although there are no video records or photos of the execution, there are colour photos taken by a German officer at Babyn Yar several days after the shooting. These pictures show Germans going through the piles of clothing of the Nazi victims, while the Soviet prisoners of war were flattening out the graves of the murdered Jews. One of the most interesting and yet most painful issues that remain in question is who exactly performed the killing of the Jews at Babyn Yar. It is reliably known that the German Sonderkommando 4A, which was a subdivision of the Einsatzgruppe C, bears direct responsibility. It was assisted by the 45th Hamburg Reserve Battalion and the 303 Bremen Police Battalion as well as local interpreters and the Auxiliary Ukrainian Police. However, the issue of the Ukrainian military formations created by the Organisation of Ukrainian Nationalists headed by Colonel Andriy Melnyk (OUN-M) remains unclear to date. According to Dutch researcher Karel Berkhoff, who relies on a broad evidentiary basis, at least two military formations created by the OUN-M were in Kyiv during the shooting of Jews at Babyn Yar. The first formation was the squad of Ukrainian policemen mainly from Galicia and Transcarpathia under the command of Ivan Kediulych, which arrived in the capital of Ukraine on September 24, 1941. The second one was the Bukovinian Kurin, the first group of which arrived in Kyiv “shortly after it was liberated from the Bolsheviks” according to the memories of the participants. It remains unclear whether these units were present at Babyn Yar during the shooting. And if they were there, the question of the functions they performed also remains open. It is known that Stepan Fedak, a member of the OUN-M, was one of the interpreters of the Sondercommando 4A. Fedak is known in history for shooting the car in which Poland’s chief of state, Józef Piłsudski, and Lviv governor, Kazimierz Grabowski, were driving in Lviv on September 25th 1921. Grabowski was injured in the assassination attempt, but Piłsudski was not hurt. When Fedak joined the Einsatzgruppe C in the summer of 1941, his main duties included translating documents from Russian and Ukrainian into German and participating in arrests. According to testimonies made at post-war trials in West Germany, during the shooting at Babyn Yar, he was patrolling the road which led to the massacre site. Another point of view regarding participation of the Bukovinian Kurin in the killing of Jews at Babyn Yar is represented by Vitaliy Nakhmanovich, a historian and leading research fellow of the Museum of the History of Kyiv and executive secretary of the public committee for the commemoration of the victims of Babyn Yar. He also examined a large number of sources, mostly memories and diaries of the participants and reached the conclusion that the Bukovinian Kurin arrived in Kyiv in the first fortnight of November 1941, i.e. after the mass execution of Jews in Babyn Yar. 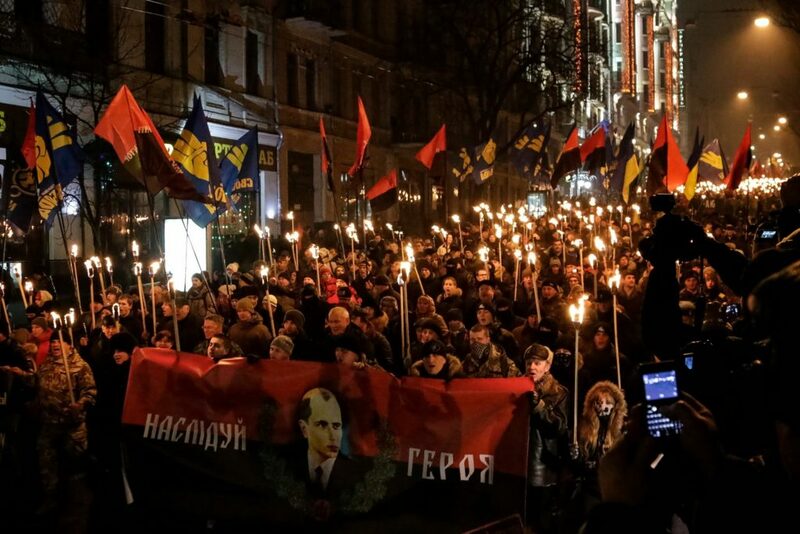 At the same time, there is no doubt that the auxiliary parts of the Ukrainian police were present, which was recruiting not only the OUN members, but also former Soviet prisoners of war and civilians. Members of the OUN-M, who sought to co-operate with the Germans for several months after shooting of Jews in Babyn Yar, published the newspaper Ukrainske Slovo (Ukrainian Word) in Kyiv. This newspaper contained many antisemitic articles, in which the Jews were equated with Bolshevism and accused of “oppression” of the Ukrainian people. There were further executions in Babyn Yar. It became the resting place for non-Jewish members of Jewish families, Soviet prisoners of war, Roma, and Red Army partisans. One theory is that the bodies of the OUN-M members, who came into conflict with the occupation authorities in late 1941/early 1942, and of head of Kyiv City Administration, Volodymyr Bahaziy was placed there after they were shot by the Germans. In 1943, when it was clear that the Wehrmacht would retreat from the occupied Eastern territories, the Third Reich initiated a new operation named “Sonderaktion 1005”, which aimed to hide evidence of the mass murders. Those who were forced to perform this horrible task provided various numbers of the exhumed and burnt corpses, ranging from 45,000 to 120,000, most of whichwere Jews. Even prior to Nazi Germany’s surrender in March 1945 the Ukrainian Soviet government adopted a decree “On the construction of a memorial on the territory of Babyn Yar”. However, as an antisemitic campaign was gaining momentum in the Soviet Union in the late 1940s under the motto of the “battle against cosmopolitanism”, the construction never commenced. In 1950 – 1960s the Jewish, Karaim, Muslim and Orthodox cemeteries were destroyed at Babyn Yar. In March 1961 another tragedy occurred in this area, which took many lives and destroyed a large number of residential houses. Water and mud which had built up in the area as a result of hydraulic earthworks burst the protective embankment and flooded some blocks between Frunze and Novo-Konstantynivska Streets. The first monument was opened only in 1976 in memory of the “Soviet citizens and prisoners of war and officers of the Soviet Army shot by the Nazis at Babyn Yar”. As can be noted from its very title, the monument did not indicate the ethnicity of the majority of people massacred at that site. Later a park of culture and leisure for the Shevchenkivskyi district, covering 118 hectares, was built on the territory of Babyn Yar. In fact nothing “authentic” from Babyn Yar was left by the 1980s. During the period of Ukraine’s independence, there were no largescale constructions on the territory of Babyn Yar. The only exception was the opening of Dorohozhychi metro station at the corner of Melnikov and Olena Teliha Streets in 2000. After the dissolution of the Soviet Union, several different monuments were erected on the territory of Babyn Yar. On the 50th anniversary of the execution, on September 29th 1991, a monument to the Jews massacred by the Nazis in Babyn Yar was opened on the site of the former Kyrylivske Orthodox cemetery, with the leaders of the young state attending the ceremony. The monument was Menorah-shaped and was titled respectively, which indicated the Jewish ethnicity of the victims. 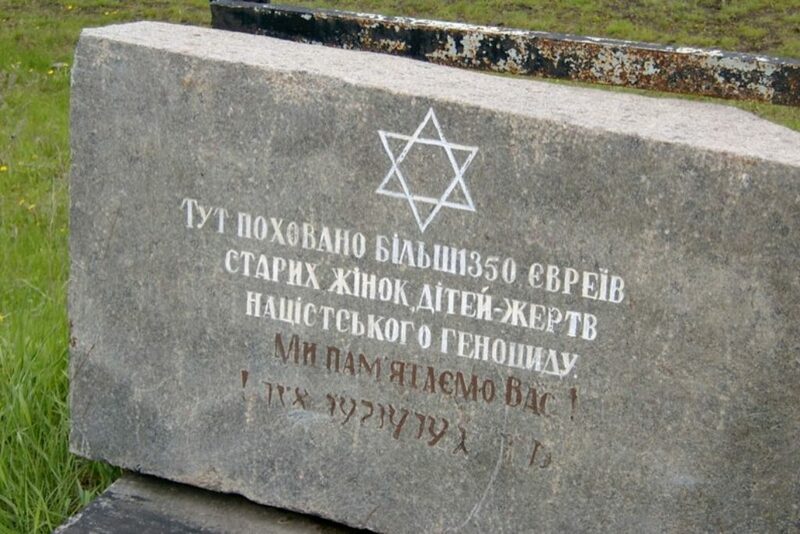 At the same time, a tablet in Russian and Yiddish was attached to the monument which was erected in 1976. Around the same time, wooden cross were installed in Babyn Yar in memory of the OUN members murdered by the Nazis in Kyiv during the war. According to the official statement of the OUN successors from Ukrainian diaspora and Ukraine, Germans killed 621 members. In more than 20 years since Ukraine’s independence, around 29 plaques, monuments and memorial signs were installed on the territory of Babyn Yar, mostly by private initiatives. In April 2003, civic activists represented by the Ukrainian liberal intelligentsia of Ukrainian and Jewish origin consolidated to establish the Public Committee for the Commemoration the Victims of Babyn Yar (The “Babyn Yar” Committee). The co-chairs of the committee were: Semyon Gluzman, Ivan Dziuba, Myroslav Popovych, and Vitaliy Nakhmanovich as the executive secretary. The main objectives established by the “Babyn Yar” Committee included the “establishment of a state historical memorial sanctuary; a national memorial at Babyn Yar in memory of the Holocaust victims of fascism and totalitarianism; and an opening of a state museum at Babyn Yar”. As to the material effects of the committee’s work, the first book of a five-volume collection of archival documents and research papers titled Babyn Yar: Man, Authority, History was published, dedicated to the historical topography of Babyn Yar and the overall chronology of events which took place during the Nazi occupation. The committee also initiated a number of academic conferences. Between 2005and 2008 three nationwide conferences titled “Second World War and the Fate of the Peoples of Ukraine” took place. Funding was provided by the State Committee of Ukraine on Nationalities and Migration. In November 2005 Kyiv International Institute of Sociology, commissioned by “Babyn Yar” Committee, conducted a nationwide survey to identify the level of awareness of the history of Babyn Yar among Ukrainian citizens. Further, a comprehensive programme for research of public opinion regarding the issue was developed which so far has not been implemented due to lack of funding. Nevertheless, on the 70th anniversary of the shooting at Babyn Yar, an international academic conference titled “Babyn Yar: history and memory of a massacre” was held in 2011. Since 1991 Ukraine’s government has not pursued a concrete or clear policy regarding the legal status of the territory of Babyn Yar. At the time of Leonid Kuchma’s presidency, the cabinet of ministers of Ukraine adopted a decree in December 2001 which stated that “the complex of monuments at the site of the mass killing of civilians and prisoners of war at Babyn Yar during the Nazi occupation of 1976 – 2001” was to be placed on the state register of monuments of Ukraine. During Viktor Yushchenko’s presidency, the territory of Babyn Yar, where the monuments had been installed, was granted the status of state historical memorial sanctuary. One of Yushchenko’s last decrees issued in February 2010 was to grant national status to the sanctuary. However, all those actions were mere formalities. Putting aside verbal rhetoric, however, little has changed even after the revolutionary events in Ukraine of the late 2013 and early 2014. Nakhmanovich noted in 2015 that only “a small portion of the territory which should be turned into the memorial complex has been transferred to the sanctuary … Site developing problems have not been resolved. The Jewish cemetery, which was actively developed already in post-war times, was not included in the sanctuary.” Nakhmanovich also argues that Ukraine, unlike Poland for example in relation to the Auschwitz memorial, does not have the “state’s position”. The Ukrainian Institute of National Remembrance (UINR) was established during Yushchenko’s presidential term. During this, the institute was primarily promoting the Holodomor events of 1932 – 1933 as genocide and glorifying the OUN and the Ukrainian Insurgent Army (UPA). The institute hardly conducted any real research and was mostly engaged in propaganda activities. During that period there was not a single discussion held on the role of Ukrainians in the Holocaust, including participation (or non-participation) of the OUN-M members in the shooting of Jews at Babyn Yar. Under Viktor Yanukovych’s presidency, the “neo-Soviet” vision of the Second World War was adopted which seemed to be inspired by the late Leonid Brezhnev. The management of the institute was replaced, and it no longer had any significance. On June 26th 2015 the UINR held a consultation on the prospects of developing a Babyn Yar sanctuary. During the meeting it was decided to hold a public roundtable in September 2015. Yet, to the best of my knowledge, this roundtable never took place. As may be noted from publications and statements made by the UINR, it is not planning to hold a painful debate on the participation of non-Jewish population of Ukraine in the Holocaust. It is difficult to say why it is so. One reason might be that the UINR is “mechanically” following the post-Soviet tradition of avoiding “difficult” problems, the study of which could allegedly “undermine” political “stability” in the country. Another reason might lie in the political views of the director and some of the employees of the Institute. Viatrovych was known as a proponent of the OUN-B and belongs to the group that advocates for the so-called “nationalistic” model of remembrance of the Second World War. In their views, any such debate on participation in persecution and killing of the Jews by any Ukrainian political actors or military formations during the war could “undermine” the national identity and “harm” the statehood. Most likely, it is not a political factor that matters, but bureaucratic and economic factors. Even if the management of the institute is willing to take an active part in arranging the sites of massacres, the UINR has rather limited resources and has no clear mechanisms to implement its declared solutions. At least formally, the UINR engages the following non-governmental research and educational institutions to resolve problems of commemoration sites in Babyn Yar. Therefore the decree does not accentuate that Babyn Yar is, first and foremost, a place of a Jewish suffering. Interestingly, there is a “reference” on Babyn Yar on the UINR website which provides much information about the killing of Jews, however, it is silent about Ukrainian participation in the execution of Jews. According to the UINR, only Germans were the murderers: “During the German occupation of Kyiv in 1941 – 1943 Babyn Yar was the site of mass executions of Jews and Roma, Soviet prisoners of war, prisoners of the Syrets concentration camp, as well as members of the Soviet underground, [and] members of the Organisation of Ukrainian Nationalists”. The history of Babyn Yar is also instrumentalised by pro-Russian propagandists. For example, in 2013 the Russian Historical Memory Foundation produced a documentary called “Babyn Yar. Last witnesses”. This foundation is headed by Alexander Dyukov under the guise of studying the Holocaust and other crimes committed by Nazism and different national movements in Central and Eastern Europe. Dyukov has been for many years engaged in assisting Vladimir Putin’s regime in propaganda attacks against the Baltic region states and Ukraine. Dyukov and people like him do not treat the history of the Holocaust as a part of national (in this case – Russian) narrative, but only as an instrument to highlight “neo-Nazis” in these states. It is also illustrative that the documentary film was produced during the presidential term of Yanukovych when, as opposed to Yushchenko’s term, the “nationalistic narrative” was suppressed and forced out from public discourse. The documentary is abundant with exaggerations, misrepresentations and open falsifications. It mentions relatively marginal publications of “revisionism” of Babyn Yar history which came out in several small newspapers in 1990s and one publication in the Internet. The authors of the film hold the view that “everything was fine” with the commemoration of the Nazi victims during the Soviet period. Interestingly, they note that “Babyn Yar is covered with earth. There is a park there now”, however they fail to mention that this was done not during Ukraine’s independence, but during Soviet times. The film also mentions that, unlike in Germany, there is no punishment for the denial of the Holocaust in Ukraine. Interestingly, there is no such punishment in Russia, as well. Indeed, knowledge about the Holocaust is unfortunately low, sometimes way too low in Ukraine. There was no discussion in the country about participation of non-Jewish, non-German population in the Holocaust, unlike in Poland. Yet, were there any such discussions in Russia? Is that not the reason why Jürgen Graf, one of the “leading” Holocaust deniers, has moved from Switzerland to Moscow? While watching the film, I personally had the impression that the authors selectively “edited” testimonies of the witnesses in order to create a negative image of “Western Ukraine” and oppose different Ukrainian regions with each other. The film suggests that only the members of the OUN from Galicia were in the police which killed the Jews. The authors of the film failed to mention that many Russians were willing to kill Jews for a piece of bread and immunity from beating and disease in the camps for the Soviet prisoners of war. The film also contains factual errors. For example, the police superintendent in Kyiv whose surname was Orlyk is represented as an active OUN member named Dmytro Myron (nicknamed “Maksym Orlyk”). Periodically various provocations take place on the territory of the massacre. For example, on the night of September 13th 2015 an unidentified person placed car tyres around the Menorah monument, poured petrol on them and set them ablaze. The fire was extinguished only due to the assistance of the guard of the Orthodox Church which was not far from the monument. According to some records, this is already the sixth act of vandalism on the sanctuary’s territory since the start of 2015. It is largely due to the fact that there is no security present at the memorial complex. This attack was very similar to another desecration of the monument to the Holocaust victims in Kostiantynivka village of Melitopol Raion in Donetsk Oblast which occurred on the night of September 27th 2015. There, the monument was also vandalised with car tyres and fire. The similarities of such acts suggests that this was a deliberate action with the purpose to accuse the “people of the Maidan” for such acts, as car tyres were the symbol of resistance to the Yanukovych regime in the winter of 2013 – 2014. Certainly the history of commemoration of Babyn Yar from 1991 until today should not be described only as a relationship between the post-Soviet (Ukrainian) officials and the representatives of the Jewish and other communities, which put forward initiatives to install various monuments or even erect buildings. To that end, initiatives of the people who represented themselves as leaders of the Jewish communities in Ukraine are illustrative. After the collapse of the Soviet regime, dozens of organisations emerged in Ukraine declaring that they represented the Jewish population of the country. In 2002, Dr Amos Avgar, the Joint Distribution Committee country director for central, western and southern Ukraine came forward with an initiative to build the “Heritage” Jewish Community Centre on the territory of Babyn Yar. This initiative, put forward by Avgar who lacked knowledge of Russian or Ukrainian and did not know much about the situation in Ukraine at that time, was supported by many leaders of organisations naming themselves Jewish. For example, this project was endorsed by the Ukrainian businessman and president of the All-Ukrainian Jewish Congress Vadim Rabinovich, the president of the Jewish Council of Ukraine, Ilya Levitas, and the head of the Ukrainian Anti-Fascist Committee, Alexander Shlayen. This initiative was opposed by the general Ukrainian public which was represented by both Jews and Ukrainians. Particularly, the erection of “Heritage” at Babyn Yar was criticised by the head of the Association of Jewish organisations and communities (Vaad) of Ukraine, Josef Zissels, the head of the Ukrainian Centre for Holocaust Studies, Dr Anatoly Podolsky, Vitaliy Nakhmanovich and many others. Forum of Russian Speaking Jewry, Alexander Levin, proposed the then President Viktor Yanukovych with a project for construction of a “memorial and community centre” at Babyn Yar. It was planned that this “centre” would include an “interactive pavilion” with the scene of killing carried out in autumn of 1941 reconstructed with the help of “Hollywood special effects”. In his interview, Levin stated that “The Complex, which shall include the Community centre, will be a flamboyant symbol of revival. At the very place where attempts had been made to wipe the Jews off the maps, children will learn Torah”. As far as I am aware, implementation of this project was never commenced. Yuri Radchenko is the director of the Centre for Research on Inter-Ethnic Relations in Eastern Europe (Kharkiv), a lecturer at the Institute of Oriental Studies and International Relations at “Kharkiv Collegium” and a Yad Hanadiv/ Beracha Foundation post-doctoral Fellow (Jerusalem, Israel).